This week I had the 'pleasure' of sampling the customer support of 2 well-known tech companies. The first was a company I will call X, which had mysteriously started billing Helena's credit card monthly for 'online services'. The second was Apple, after Helena's Mac Mini bit the dust. Company X is a large one, and many tech companies seem to emulate it's service practices, so it is really representative of a large number of companies. On the face of it, X's service was slick, high-tech, and hip. What this means is that every 'operator' is young, fast, and multi-tasking. I have no doubt that these hipsters were handling 2 or even 3 calls at a time. You can tell, because you never seem to have their full attention. Every question is followed by a pause, presumably as they switch back to your call. These young multi-taskers seem bright and helpful, and I'm sure they felt highly productive, but really, their main purpose seems to be moving you along to the next person in the service chain. And these chains have loops. You think you are making progress as you move from the general operator, to the billing department, to tech support, to the accounts department, and then all of a sudden you are routed back to the general operator, who tries to push you back into the Circle of Frustration as fast as possible. It is almost as if X has hired a bunch of untrained kids who's job it is to forward you to the next kid, until you give up and hang up. Helena did give up when she tried, and handed the problem to me. I was more persistent and insistent, and finally broke out of the Circle of Frustration to reach someone who could actually help me. That was 70 minutes later. 45 seconds later, a female service agent was at my elbow. Remarkably, she did not repeat the same basic questions. Instead, she made eye contact, and then used her iPad to scan the barcode on the back of the broken computer. Then she asked me two or three more detailed questions about my computer and problem, touched her iPad mysteriously, and calmly walked me over to the 'Genius Bar'. There, another Apple employee took a form off a printer and handed it to her. The form was preprinted with all my contact and case info. I signed the form as requested, she took the computer out of my hand and slipped it into a bag with copies of the paper work, and told me it would be fixed on Tuesday. Total elapse time: perhaps 5 minutes. "What does this have to do with boatbuilding?" I can hear you asking. Just this: the X approach to problem solving is to multi-task -- to work on a bunch of problems simultaneously, to work as fast as possible, to flit from one problem to the next -- seeming to do a lot, but actually to get nothing done. In contrast, the Apple employees worked slower. They were not in a rush. They made eye contact. When they were working with you, they were only working with you, and no one else. I had the feeling that these kids had nothing to do that was more important than solving my problem. And solve it they did. Slowly, calmly, methodically. There was no multi-tasking, no flitting about. By focusing on just me, on just my problem, for a few moments, they solved my problem. Not in 70 minutes, but in 5. This struck me, because in the face of a long boatbuilding to-do list, I've adopted the same focused strategy. Tackle one problem at a time and work at it -- calmly (mostly! ), without distraction -- until it's done. Sometimes it's frustrating, because some tasks take a long (long!) time, but eventually, if you stick to it, you will finish. All this is a long way to say, I've finally installed my boomkin! I gathered all the parts, tools, and fasteners needed (I made a check list, to be sure) and rowed out to the Blue Moon to do the install. I didn't take any blow-by-blow pictures during the assembly, because most of the time my hands were covered with Dophinite bedding compound, which is sticky and seems to get everywhere. Here is a shot that shows the two plates which hold the spars together, and provide bases for the sheet block and boomkin stay. If you click on the picture, you can also see the stay. Here's an overhead shot with some more detail. The new boomkin is a foot longer than the old boomkin, so the wire stay was not long enough. I puzzled over this problem for awhile, and then hit on the simple idea of inserting a foot of galvanized anchor chain into the line with a shackle. So from the tang on the transom, there is a foot of chain, then a turnbuckle, and then the steel wire. The turnbuckle makes it easy to adjust the tension on the boomkin. Not much is needed; just enough to snug it up. I've actually got a bit too much tension on it in these photos. I took some off, later. Some of my readers have wondered how the boomkins are attached inboard. Here's a photo of the simple arrangement. Finally, here are a couple photos to show how the lines of the boomkin work with the Blue Moon's lines. As one of the guys at the yacht club said, the boomkin looks like it's always been there. You can see that I have a bit too much tension on the stay in this photo. 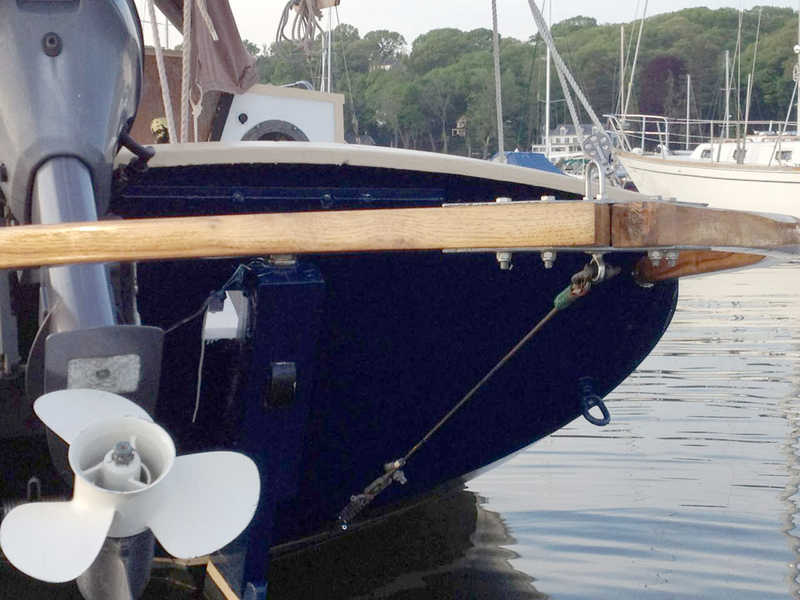 Next year, I hope to replace my painted bowsprit (which I had to shorten by a foot during my voyage up the coast), with a new varnished one, to match the boomkin. I won't be using hickory, though! You might have noticed in the overhead photo above, I've already started work replacing my rotted mast partner. The old part is cut away, and I've already laminated up a replacement piece. Now I just need to fit it and cut it to shape. Hope to have the details and pics next time. I must have missed something. Looking at your photos and boom I cannot possibly imagine the need for a boomkin. 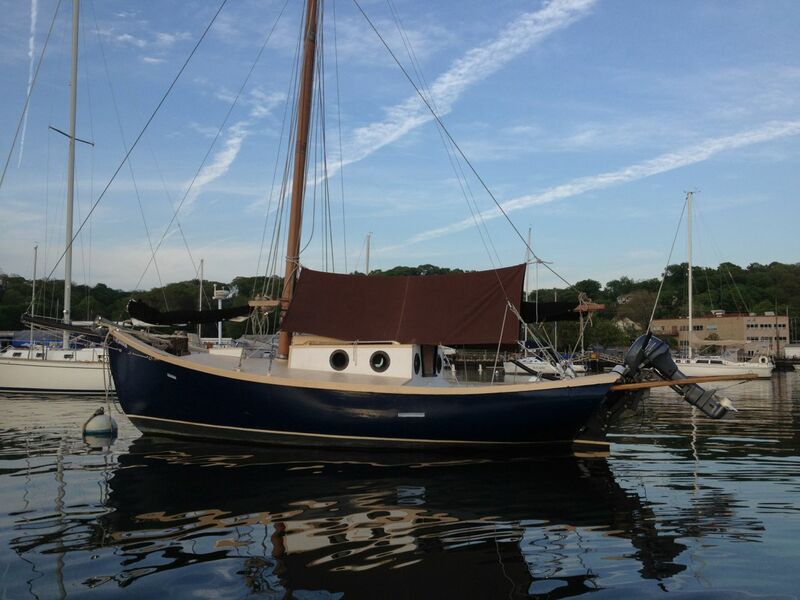 You have no mizzen and your boom does not extend past the transom. 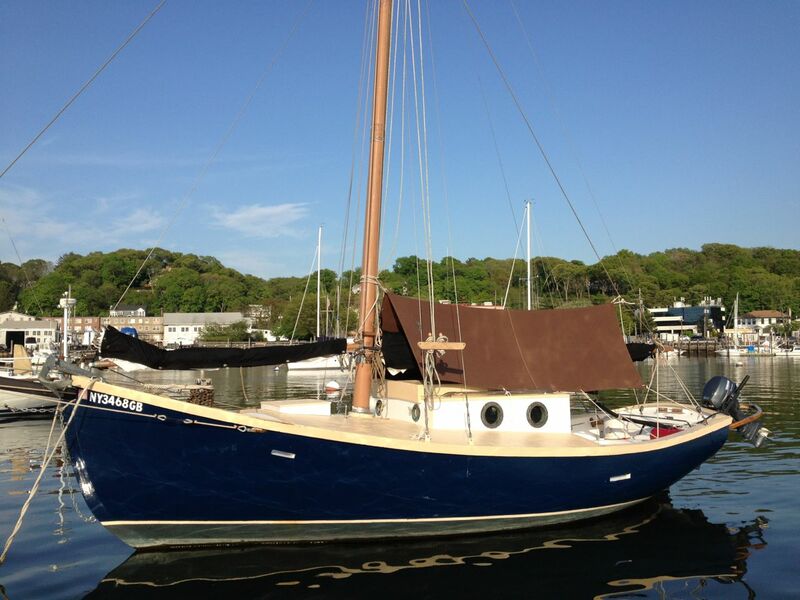 I do have a mizzen. I just couldn't use it because the boomkin didn't fit around the engine, the mast was rigged all wrong, and the mast partner was rotted. Hope to have all that finally sorted soon. I have a sligth problem with the boomkin as shown. 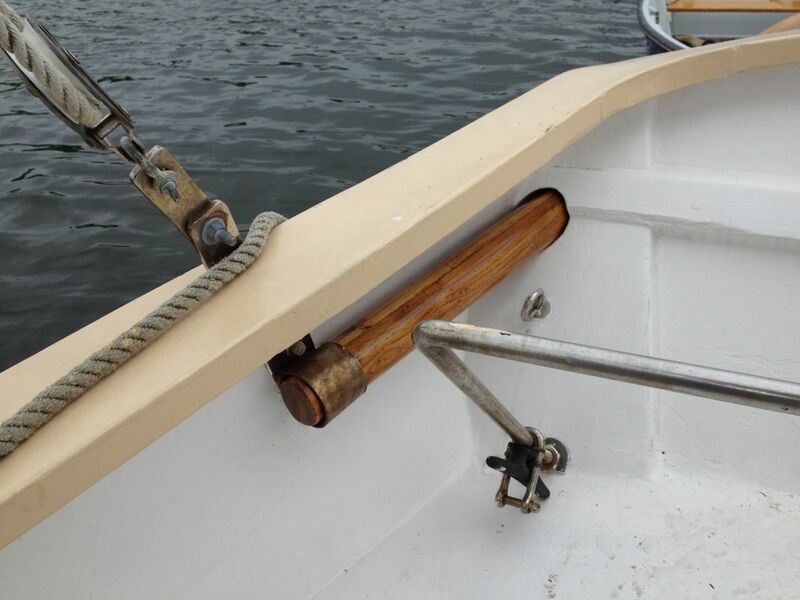 When in use, I thing there may be a forward thrust on the aft end of it from a resultant from the boomkin stay tension and the pull of the mizzen sheet. Just the shape of the spar. It's tapered at the end to fit into the metal socket, but then is too thick to fit any deeper. With reference to the bumpkin; boomkin, stern-sprit. 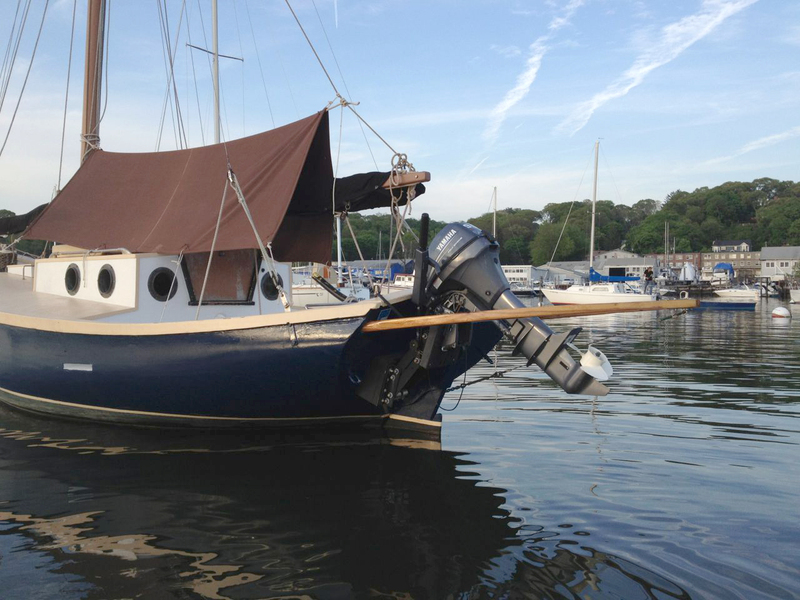 All boats have two bows; some have a bowsprit between the port bow and the starboard bow. 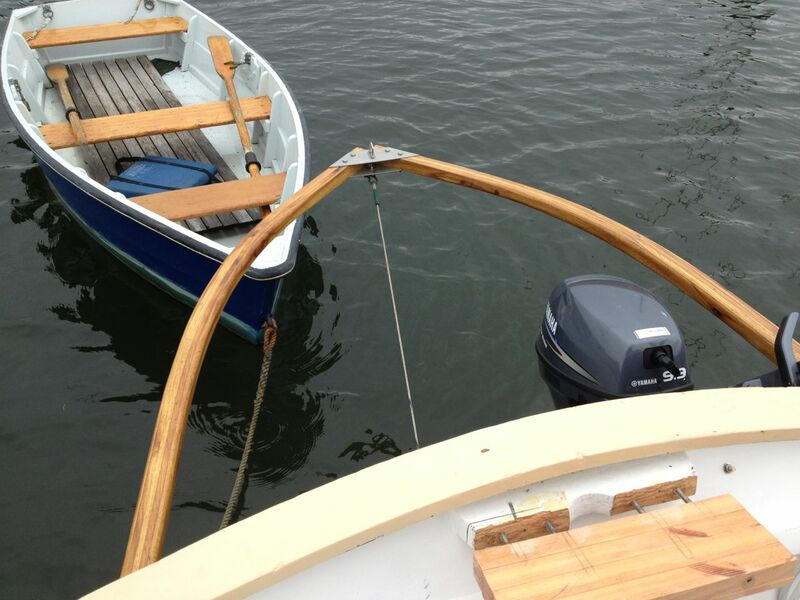 All boats have two quarters; might one not put a quarter-sprit between the two quarters? As to pronunciation and spelling. Before the C18 English spelling was highly variable and non-standard. Before the printing press it was not even important. It's easy to imagine an illiterate Cornish yokel, pressed into the RN, mispronouncing a word he couldn't write into a sound he thought he understood. Why not just one spar, like a bowsprit: No place to put it. The inboard end of a spar needs to be bolted to something. If the spar came through the transom right over the rudder, it would project into the cockpit with nothing to fix it to. Plus, it sure would be in the way! Bottom line is in boatbuilding like all of life do not make the often fatal mistake of confusing activity with accomplishment! Hail to you and your accomplishments, John! Now if I could only work faster!